This is the best live recording of Kris covering Maybe that I can find. From his June 23, 2010 show at Rialto in Tucson, AZ. Please “like” the video and tell brandibunn1 how much you enjoy the recording! 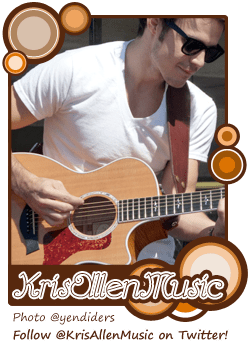 One of my favorite Kris Allen live performances EVER. From Kris’ State College show on September 2, 2010. I didn’t rip this MP3 myself. I’ve always thought the MP3 was ripped from @kt_cle/kmt8871’s video (the second one embedded below), but I just found out that it’s actually from kradamantium‘s video. Song starts at 1:20, enjoy! Kris debuted a new song called You Got A Way at his Clarkston, MI show at the DTE Energy Music Theatre tonight. The song was written by Kris with a little help from his friend Cale. This is the first good quality video that surfaced, courtesy of @RanaNYC. Another video with better audio and less chatty people, courtesy of @Kristen8108. This video from @Altrus01 isn’t the best in visual quality, but the audio is ABSOLUTELY GORGEOUS. @TheDirtyMinds have a post up on their blog where they invite people to post their guesses at the lyrics. The video was originally posted by 107.9 The End on April 15 2010 but I haven’t seen it until very recently. I just have to post it here. Kris’ vocals melt my heart, that is all. Remember you can watch on YouTube for higher quality and to increase view count! Please also thank 107.9 The End on YouTube and Twitter! Kris Allen raps Gangsta’s Paradise, acoustic style. I don’t even have words to describe the epic, ok. Kris’ show at Santa Rosa tonight was CRAZY. But the best of it all was that HE FRIGGING RAPPED GANGSTA’S PARADISE, ACOUSTIC STYLE, DUDE. I just LOVE this guy. Remember you can watch on YouTube for higher quality and to increase view count! Please also thank the videographers on YouTube and Twitter!